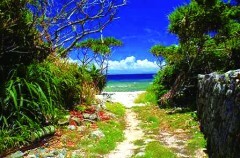 Mae Island is a long and narrow island located seven kilometers east of Tokashiki Island. Before the war a busy bonito fishery was operating on the island, and it was known as Kerama Takigi. People once tried to settle on the island, and provisional water supply system was installed. But they returned back to Okinawa main island because typhoon damage made Mae uninhabitable. Although there is no regular connection to Mae now, people travel there on leisure boats to enjoy fishing and diving.